Chanteur Country Australien né le 1er Novembre 1928 à Tamworth (New South Wales). 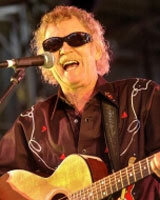 Australian Country singer born in Tamworth (New South Wales). One of the major names in country music today. Arthur Blanch was born and grew up in sheep and cattle country near the small village of Wollun, outside Tamworth. As it turned out, he was a natural singer. He sang and yodelled while mustering, feeding the dogs and milking. Soon he was entering a long round of talent quests. Arthur Blanch is the epitome of the Little Aussie Battler who has done well for himself. His Vocalss literally ooze sincerity and reality. If ever there was an instance where a country music artist has put his symbolic flesh and blood into vinyl then here it is. When Arthur Blanch was elevated to the Country Music Roll of Renown at Tamworth in 2001. It not only acknowledged a very long and succussful musical career, it also rekindled Arthur's love affair with his music, leading to some special performance moments and this his new collection of "Gems" during the celebrations of his 50 years as a recording artist. To still have chart success 50 years into a recording career is a testament to a singer's qualities - and Arthur Blanch has plenty of those. 1978 SP MC 5015 (US) . The Little Man's Got The Biggest Smile In Town / ? 1979 SP RIDGE POP 479 (AUS) . Maybe I'll Cry Over You / ?